iGo North America 2006 My Way Navigation Software 2006 is a GPS navigation software for PDA running Microsoft Windows Mobile with SD card slot. The main feature of the iGo My Way Navigation Software 2006 for North America is easy of use. There is no need to download any maps, install any software through ActiveSync or do any registration online. 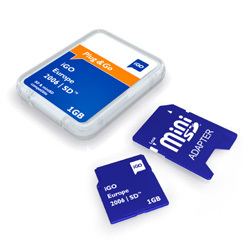 iGo North America 2006 comes in the package of 1GB SD or mini SD memory card with adapter. Together with a GPS receiver, iGo My Way can also perform voice prompted turn-by-turn navigation. the::unwired reviews iGo North America 2006 which comes with iGo My Way Navigation Software 2006 and concludes that iGo My Way definitely gives TomTom a good run for its money. There are things that iGo My Way does better than TomTom and there are certainly things that TomTom does better. I am enclosing the pros and cons for your reference. Since the race is quite close, I supposed the final purchasing decision will have to depend on what/where your priorities are as well as at what price point iGo My Way will be offered in North America. According to iGo, suggested retail price will be around 120-130 USD, including the 1GB miniSD card. That would be a very reasonably priced navigation software.